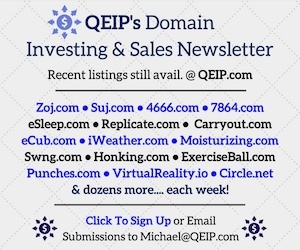 Yesterday Elliot Silver of DomainInvesting posted a nice list of domain newsletters that he liked. While its a good list there are a few holes in my opinion. The biggest being Neil Bostick’s’ QE Investment Planners. You can’t be in the LLL.com or premium name game and not be on that email. I’m not getting paid to sponsor them and nor have I met Neil. But he has super high quality names on the list and the sellers are generally looking to move. 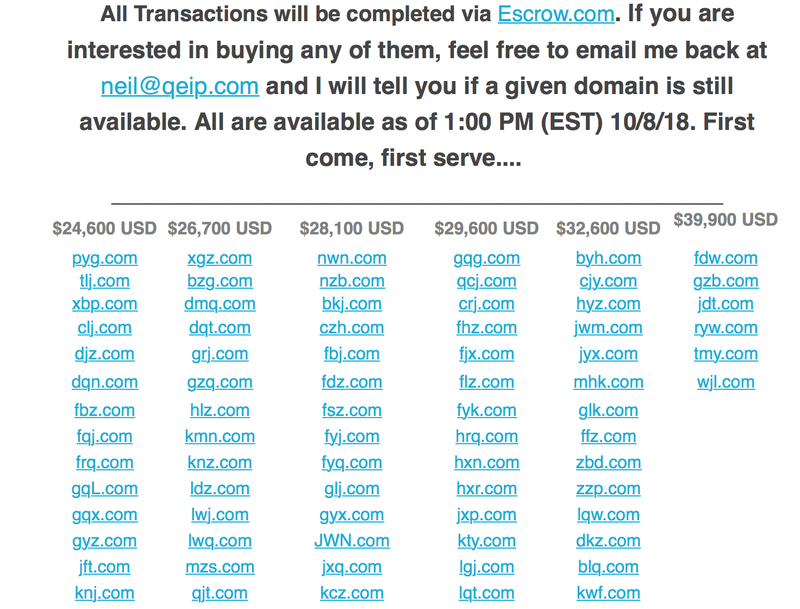 Travis and I have purchased a LLL.com off one of the newsletters this fall and we did a whole segment on Sherpa about a giant group of LLL.com that came through his newsletter that were liquidation pricing. Here is a snapshot of some of the names from back then. I have no idea what is left or not or even if the prices are the same. I just know that if you are buying names in the higher price range they are a newsletter you want to subscribe to. Another newsletter that was really good but hasn’t come out since June is John Daly’s NameConnect.com newsletter. He’s had some really good names in the past come through like Beep.com, Jamie.com and CyberSecurity dot com. Hoping that he gets it cranking again because I know many people that have purchased names off the newsletter. I’m sure Adam and Jen’s newsletter for Evergreen is going to be good but there literally has been one newsletter so far and that came this week. So it has the most potential but the least history. (You have to scroll down to the bottom of the page to sign up) Media Options newsletter is a no brainer but you have to remember to take the prices as a guide and make an offer. The high prices scare a lot of people off. Don’t lowball them but negotiations don’t start until an offer is made. DN.Biz Is another newsletter I get. The quality is not as good as the above but there is a lot of quantity and the names are at lower price points. A couple gems always seem to sneak through so you have to be fast. Like any list you have to go through a lot of names to find something you can afford and/or want. But another one worth getting. I also am $330 away from meeting my fundraising $5,000 goal on my Iten trip. So close. Here is a little about the trip and my inspiration. I have two more weeks to meet my goal.